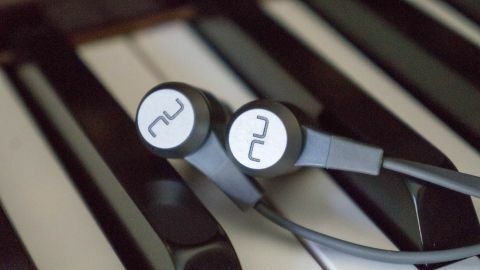 Although the NuForce BE6i is a minor refresh of the original, its longer battery life and water resistance make it a worthy choice for those looking for a good sounding headphone for an active lifestyle. As phones like the Moto Z and possibly the iPhone 7 ditch their headphone jacks, Bluetooth headphones are becoming a necessity more than a luxury. The problem is, Bluetooth headphones have traditionally sounded pretty bad. That's changed with the latest Bluetooth headphones, which sound good, although still not as good as wired headphones. Still, the slight hit in audio performance is a small price to pay for the convenience of going wireless. One of our favorite Bluetooth headphones are the Optoma NuForce BE6, which feature an aluminum build and great sound for the price. Its successor, the NuForce BE6i, is a minor refresh that bumps battery life to 8 hours (previously 6 hours) and IPX5 certification to better fight against dust, sweat and rain. Physically, the NuForce BE6i are identical to its predecessor. The headphones still feature an aluminum enclosure for its drivers and a cheap feeling plastic remote on its tangle-resistant flat wire. Aluminum makes the headphones feel bullet proof, but it also adds weight, which makes fitment a bit finicky. Luckily, Optoma includes seven pairs of ear tips for you to try and get the right fit. I'm a fan of the super comfortable Comply foam tips, but they will need to be replaced after they're gunked up. Once you do find a good fit, the NuForce BE6i deliver balanced sound. Bass lovers will want to look elsewhere, like the Marshall Major II Bluetooth or Sony XBA-H1. The balanced sound signature means the BE6i sounds good with all types of music, retaining good clarity up top and controlled bass. There are a few downsides to the NuForce BE6i, but they aren't deal breakers. I found the in-line remote cheap feeling, and its plastic microUSB port cover is difficult to open without digging in your fingernails. The headphones are also a bit heavier than I'd like, but it's a tradeoff I'm willing to make for its durable, aluminum build. The Optoma Nuforce BE6i remain one of our favorite in-ear wireless headphones for the price. It offers good sound, build quality and battery life in its segment, and is an improvement over the already excellent BE6. If you're looking for a pair of wireless in-ear headphones that can survive a strenuous work out, the NuForce BE6i should be on the top of your list of headphones to try.